On Sunday March 4, nine participants met at the Food Program Greenhouse to make up a shared starting mix and begin plantings for the 2012 growing season. After discussing the components of the mix and comparing with other recipes, we made up a large batch of starter mix, washed containers in soap and warm water and began planting. Seeds planted included 3 varieties of yellow storage onions, one type of red storage onions, summer leeks, moss curled parsley, two types of celery and fennel. In addition some previously sprouted red stemmed celery was transplanted into larger pots as well. Some members took the seed trays home to germinate in the warm and will return them once sprouted and the plants will be shared by members of the group. Some trays of starts are for the food program and will be transplanted out at participating farms later in the spring. We experimented with plantings in both the straight mix and in a mix topped with fine vermiculite to see what the difference might be in terms of germination and surface contamination by algae or mold. o Material and Description Peat is a common ingredient in soilless mixes because it is widely available, relatively inexpensive, and has desirable physical characteristics. It holds a lot of water and air and decomposes very slowly. Barks—even aged barks—should be avoided as seedling mix components because they immobilize nitrogen. o Characteristics Peat is quite acidic (pH of 3.5–4.0); limestone is usually added to the mix to balance the pH. Add about 5–15 lb lime per cubic yard for mixes containing 70% peat. Peat is not a source of plant nutrients. Color varies with extent of decay; lighter-colored peats (grower or professional grade) provide more aeration. Finer, darker peats (retail grade) are used as a soil amendment. o Common Usage Often makes up 30–80% of the mixes. Blending equal parts peat and compost results in desirable pH range. o Material and Description Is a silica-based volcanic rock that has been heated using natural gas, causing it to expand and become less dense. It improves aeration and water holding capacity of mixes. o Characteristics Perlite is sterile and has a neutral pH. o Common Usage Typically makes up 30–50% of mixes when combined with peat or high C:N compost. o Material and Description Is a micaceous mineral expanded in a furnace using natural gas. o Characteristics Handled roughly, it can lose its air holding capacity. Vermiculite can supply some K, Mg, and other trace minerals. o Material and Description Produced by red worms as they breakdown organic wastes. Inconsistent quality makes custom mixes necessary. o Characteristics Castings are nutrient rich and claimed to have growth promoting attributes. The amount of available P and N varies with bedding materials. o Common Usage Often makes up 10–40% of mixes; the proportion varies with composition in the same way as other composts or manures. Our first meeting, 3 Mar 2010, was held at Dora FitzGerald’s house (1480 cottage way) where nearly twenty folks interested in all aspects of healing foods and herbs gathered. The Herbal Collective is based on our interest in combining all our varied talents on the island to create a shared resource of herbal information, to exchange plants and remedies, and to provide tinctures and creams for use by individuals in our community who need and want them. We plan to study the properties of local plants, participate in sustainable wild crafting, and learn various methods of making tinctures, creams, and essences. We hope to make herbal products available as needed to the community. Cataloging existing remedies and tinctures that are already available for use by the community. Establishing a communications network amongst the members and all interested persons on the island by creating and distributing email and telephone listings. Forming a group to focus on propagating and growing select medicinal plants. Taking part on Seed Saturday February 20th by bringing seeds and shoots of herbs for spring planting. If you would like more information please call Dora at 3247. The 5th Annual Nettlefest Community Potluck will be happening on March 17th. One of the first real signs of spring on Galiano, and one of my favourite wild foods, are the new nettle shoots that start poking out of the ground early in the Spring. At a time when we’ve been living on frozen veggies, or cabbage and root vegetables, fresh greens are a welcome sight. Plus there’s the additional benefit that nettles are actually good for us. Nettles are extremely rich in vital nutrients, including vitamin D, which is rare in plants; vitamins C and A; and minerals, including iron, calcium, phosphorus, and magnesium. Nettle preparations also have been shown to be effective in controlling hay fever symptoms. They are good for arthritis and eczema. 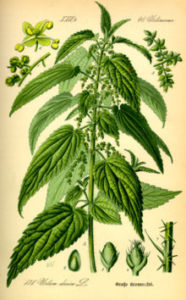 Our local nettle – Urtica dioica – is a well-known type of nettle, but it’s not the only type. There are about 30 to 40 types in the Urticaceae family. There is a type in New Zealand that grows as tall as a tree and the sting has proved deadly to dogs and horses. Nettle is best used for food when they are first coming up in the spring. Keep in mind that once the stems have started to elongate and they begin to flower, the leaves aren’t as tender. The color of the nettle leaves may vary from a light shade of green to dark green to a dark reddish-purple. Any of these leaf colorations is good for eating. However, it is said that the nettle leaves with more purple color indicates it’s richer in iron mineral. Nettles are delicious – but most first time nettle eaters are nervous about being stung. However, once the nettles are steamed, frozen, dried or cooked the sting is neutralized. There are lots of different ways to use nettles: Make a fresh batch of healing nettle tea with either fresh or dried nettles, Use fresh nettle in scrambled eggs, pasta dishes, casseroles, and soups. You can cook nettles and eat them as you would steamed spinach — their taste and appearance are similar. Make powdered nettle by grinding dried nettle leaves in a coffee grinder. You can also juice nettles and combine the juice with other fresh juices, such as carrot or apple juice. Here’s a great, simple recipe to use with spring nettles. Use this pesto on pasta, bread or anywhere you would use a basil pesto. While the blade is turning, slowly add up to 1 cup olive oil. Then add 1 cup parmesan. Let’s Occupy our Food System ! Come be part of the Spring Fever to take some control of our own food production as well as working amongst friends of all ages. The focus of the Community Greenhouse is to promote social and environmental sustainability. The project allows community members to grow their own organic herbs and vegetables 12 months of the year while engaging in a welcoming community environment. A portion of the greenhouse is used by the school children for their purposes from September through June though there is lots of room for sharing. The greenhouse project was initiated in 2010 by the Galiano Community Food Program through the Galiano Club who is responsible ultimately for its upkeep and use. 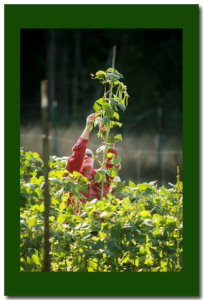 After repeatedly hearing that the community was interested in growing year-round, the Food Program was successful in receiving a VanCity grant to fund the project. Today there is a 20′ by 16′ poly greenhouse located on the grounds of the Galiano Community School. The greenhouse contains a large U-shaped raised bed, a large work bench and a shelving unit.. The beds are fitted with an in-ground drip irrigation system to minimize water consumption as the crops mature. The Greenhouse Project is divided into the Spring Starts group and the year round group. There is a cost of participating which has been $20 per person but could be revisited each year. This is used to purchase organic seeds, tools, etc. all at the groups discretion. If desired, the group can elect to pool extra funds for special projects. * The Community greenhouse is a teaching and learning facility first and foremost and is secondarily about production. The Galiano Community School also uses the greenhouse for their teaching purposes. * The greenhouse is a SHARED facility and must be used respectfully. Participants are encouraged to look after each other’s crops and report anything unusual or any problems to a Food Program representative. * Given the size of the greenhouse, a limit of eight people per season is recommended. Two participants from a previous year will be encouraged to stay on in order to ensure continuity and the rest of the group will be determined by lottery, if there is more interest than spaces available. There will be a waiting list in order to ensure continued participation, should some participants be unable to complete their growing season. People can participate fully or partially depending on life schedules. * SECURITY: Right now, we are not using a key system, but this policy may be revisited as required. * The Food Program promotes organic methods of gardening. Use of herbicides and chemical pesticides are strictly prohibited. * All plant waste to be deposited outside of the Greenhouse in the appropriate compost. * No pets are permitted in the Greenhouse. *No Smoking inside the Greenhouse or on school ground. Starts Group: Get a jump on the growing season ! Learn what to start and when as well as how to make great potting mixes. Planning meeting Sun. Feb 26, 11 am @ the greenhouse.